The teres major (L. teres, round and long ; major, larger.) is a thick, rounded muscle in the posterior shoulder region. It acts on the shoulder joint, with its main function as a synergist in shoulder adduction. …It lies neither superficial to, nor deep to, any other muscles. It’s located superior to the latissimus dorsi and inferior to the rear deltoid, teres minor and infraspinatus. It originates from the inferior angle of the scapula, and travels superolaterally to its insertion on the medial proximal humerus. It has a parallel fiber orientation and a strap-like muscle shape. With its position above the lats and below the posterior shoulder, the teres major constitutes the widest part of the back. Thus, it is an integral component of the coveted ‘v-taper’ look. The visual impact of the teres major becomes obvious during the classic back double biceps pose, assuming sufficient back development and low enough body fat percentage. Note: The following table includes the exercises that most directly target teres major. These are also latissimus dorsi exercises, since the teres major works synergistically with the lats when acting on the shoulder joint. The following stretches are general back or latissimus dorsi stretches, which also stretch the teres major. Overactive/Short Teres Major: The teres major is overactive and short in people with upper crossed syndrome (UCS). The shoulder internal rotation associated with UCS facilitates the teres major, which causes reciprocal inhibition of the external rotators. 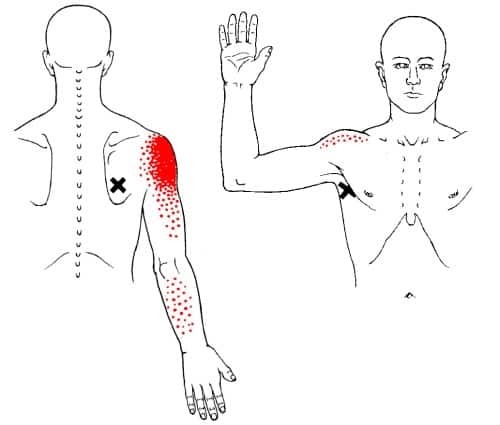 The overactive/short teres major can limit overhead range of motion, as its inability to stretch sufficiently will physically restrict the upper arm from elevating past a certain point. The initial cause of the teres major overactivity is often a combination of poor postural habits (i.e. arms in, hunching over) and an excessive focus on lat exercises and, to a lesser extent, chest exercises. Reduce your training volume on teres major exercises and lat exercises. If your overhead range of motion is limited, avoid vertical push exercises like the overhead press. Do high-incline push exercises instead (e.g. shoulder press on 60-75° incline). This way, you can still train the front delts with heavy weight but avoid injury by staying within a safer range of motion. Perform teres major releases/stretches on a daily basis, ideally as part of a more comprehensive mobility routine. These techniques should also be part of your warm up routine for workout involving any upper body lifts and lower body lifts that work the back or require shoulder mobility (e.g. deadlifts, squats, Olympic lifts). Have good postural awareness. Avoid slouching over and internally rotating your shoulders. If you’re sitting down for long periods, get up for a quick break at least every half hour to split up the time spent in that posture. Walk around or stretch out your teres major (and any other tight muscles if you have time). Do more exercises that involve shoulder external rotation, as opposed to shoulder internal rotation. Examples include: face pulls, prone cobra, any YTWL variations, Cuban press and shoulder external rotations. If upper crossed syndrome is the cause of your teres major dysfunction, then you’ll need to address that with a more comprehensive approach than what is outlined above. See how to fix upper crossed syndrome (article coming soon) for a detailed plan. Although the teres major may be an important part of an aesthetic physique, it’s impossible to isolate them. It will grow incidentally from doing any horizontal or vertical pull exercise (i.e. any row or pull up/pulldown variations). What a great site. I mean, so many many details!!! I want to thank you for all your effort and time you have devoted to this. Hi, have you ever considered isolating the motions for each muscle that would verify that it is the one that is strained/ torn, if possible? This site is awesome, I just can’t be sure I’ve got exactly the right muscle. Thanks for all of the work and information. There are certainly ways to do that for muscles strains, in general. 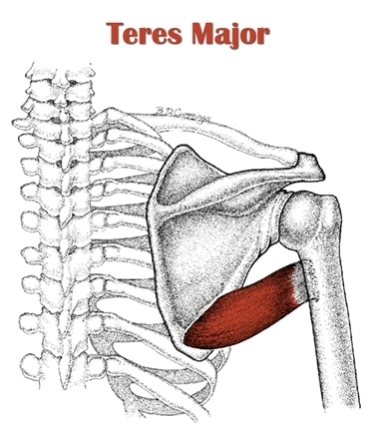 However, for the teres major it’s a bit more difficult since it’s so close to the latissimus dorsi in terms of both location and actions. That said, whether it’s the lat or teres major, treatments would have a lot of overlap.